“Simply Stated Profundities: Truths of Sobriety” from Christian Faith Publishing author Gary S. Storch offers humor, understanding, and inspiration to those struggling with alcoholism. Amassed as he struggled to overcome alcoholism for years, Gary S. Storch shares insights into the struggle to over addiction as well as inspiration for those in recovery. “Simply Stated Profundities: Truths of Sobriety”: an inspirational collection of simply stated profundities about the recovery process from someone who struggled with alcoholism. 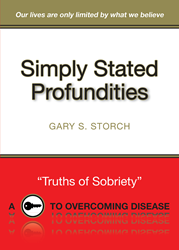 “Simply Stated Profundities: Truths of Sobriety” is the creation of published author, Gary S. Storch. Storch was born and raised in Cleveland, Ohio. He graduated from high school in 1979 then later joined the US Army. Published by Christian Faith Publishing, Gary S. Storch’s new book is an inspirational collection of simply stated profundities, which are practical short sentences that carry a greater meaning to the person who has experienced what the profundity is about. Until the promise of a new freedom through sobriety, Gary's life was a roller coaster of disappointments and geographical cures. Now Living with a daily awareness of a higher power, who Gary calls "Jesus," his life has truly been transformed. These “Truths of Sobriety” will stir the minds of many recovering men and women who enjoy the gift of sobriety each and every day. More than 10 million recovering men and women have found their true and blessed higher power, which continues to carry them on their worst days. “Simply Stated Profundities: Truths of Sobriety” reflects upon their struggles while offering humor, understanding, and inspiration. View a synopsis of “Simply Stated Profundities: Truths of Sobriety” on YouTube. Consumers can purchase “Simply Stated Profundities: Truths of Sobriety” at traditional brick & mortar bookstores, or online at Amazon.com, Apple iTunes store, or Barnes and Noble. For additional information or inquiries about “Simply Stated Profundities: Truths of Sobriety”, contact the Christian Faith Publishing media department at 866-554-0919.